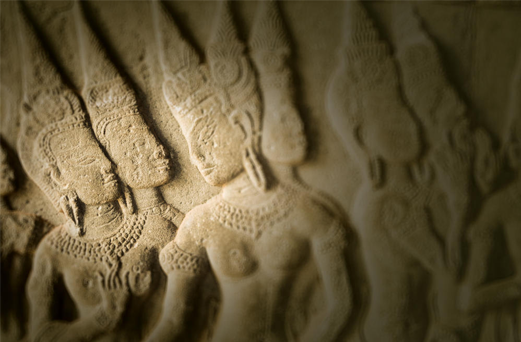 From Apsaras and kings to princesses and warriors, this room contains the busts and statues of distinct fashions and styles as they evolved throughout Angkor time. There’s also a collection of ancient jewellery and headdresses. It’s a clever segue to the final room — the gift shop — where upscale imitations of these fashions abound. It’s $12 to enter the museum, plus another $3 if you want to bring in your camera and another $3 for an educational headset. Sadly, like ticketing and management of the Angkor park, the museum is owned and run by a private company, so little of your admission money goes to Cambodia or to temple restoration (though what the company paid for the concession might). Still, it’s perhaps better than these artefacts remaining in the hands of private collectors. A connected mall is still under construction but has a few open stores, including a Blue Pumpkin satellite, several souvenir shops and the sure sign of apocalypse.